photos by Zoë and Robert Rodriguez. 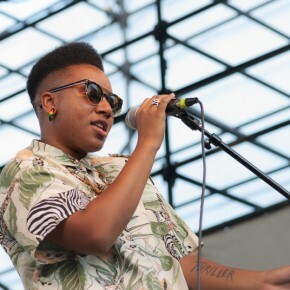 Catherine Harris-White of THEESatisfaction. Photo by Zoë and Robert Rodriguez. 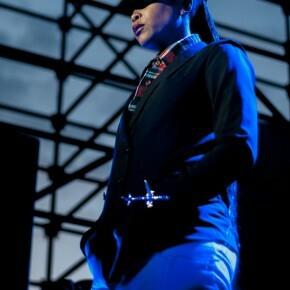 Stasia Irons of THEESatisfaction. Photo by Zoë and Robert Rodriguez. Erykah Badu. Photo by Zoë and Robert Rodriguez. Twilight Concert Series crowd at the Erykah Badu concert. Photo by Zoë and Robert Rodriguez. 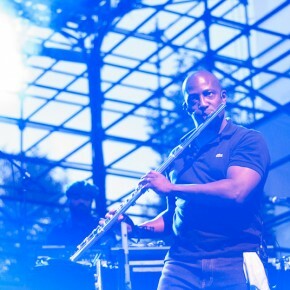 Dwayne Kerr on flute. Photo by Zoë and Robert Rodriguez. Cleon Edwards on drums. Photo by Zoë and Robert Rodriguez. 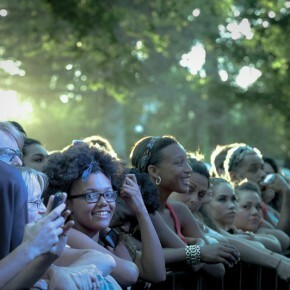 Thursday night’s crowd was much smaller than for many of the other acts of this summer’s Twilight Concert Series, and many of Erykah Badu’s fans were older than previous audiences. Lots of white wine drinkers, if you know what I mean. Still, they were just as enthusiastic. Opening act THEESatisfaction got the people moving right off the beat with their blend of hip-hop and throwback psychedelic soul. 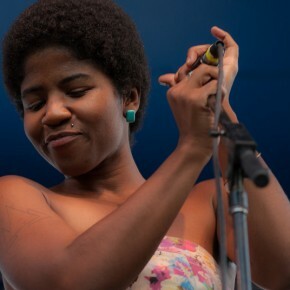 Their musical stylings were in many ways similar to (and likely influenced by) Badu’s work, and I heard a number of people in the crowd remark that they had never heard of the duo before but that they were pleasantly surprised. The setup between acts took much longer than is typical for a professionally run concert, and I saw people who had fought to be against the front rails beginning to yawn. The big screen behind the stage began playing video clips to pass the time, presumably of backstage footage from other parts of the tour. 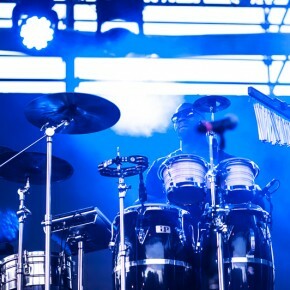 To be fair, there was some equipment to set up at the front of the stage (Badu played a synth drum and ran a laptop and a sampler in addition to singing) but it felt like the stage manager was stalling. 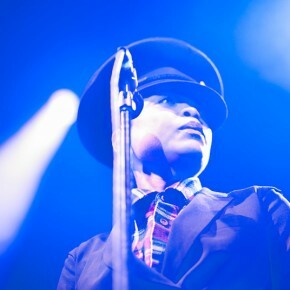 When Badu arrived on stage in her modified air captain’s uniform though, it was clearly worth the wait. Every inch an entertainer, she brought humor, sensuality, love, loss, and even political consciousness without being preachy or depressing. Her infectious energy and sensuality hasn’t faded one bit since her start back in 1996.